The Italian government has passed a law that might have a negative impact on the poker industry. This new law might ban all gambling advertising and this will have adverse effect to the poker industry. The Italian senate voted 155-125 favouring the passing of the Dignity Decree which will have a severe impact on the gambling industry and this might have great effect on the online sector. This new law will ban all forms of advertising on gambling products where a player will win money. The law only gives an exception to the state-run lottery. Sponsorships and existing contracts are grandfathered in until June 30, 2019. The Deputy Prime Minister Luigi Di Maio said that the disease of the game has been an obstacle and that his aim is to have it eliminated. He pointed out that the prohibition of advertising the game is one way that will assist him meet his goals. This news comes a few months after things were looking relatively positive. In January an official in the Italian government hinted that there will be an upswing as Italy watched Spain and France band together with shared liquidity with Portugal. The official said that the government had started a verification process that will steer forward the shared liquidity where there would be international agreements. More the press release it was said that the general elections could have an impact on the country’s gambling policy. It appears that the changes were on the negative side with Di Maio and Five Star Movement Party in power. PokerScout ranked PokerStars’ as the nation leader in poker offerings where the weekly cash average was about 575 players. This would represent a huge addition to PokerStars Europe the shared liquidity client and its 1,600 players. With advertising being banned on sharing online casino info, this means that enrolling new customer will be hard and this number will drop. There are chances that the ban on advertisement and shared liquidity agreement might not be mutually exclusive. The ban will without doubt bring a blow to the industry regardless of what will happen. There might be chances that it will hamper the chances of Italy being part of France, Portugal and Spain. According to Di Maio the ban on advertisements is meant to curb problem gambling. He said that the social cost of gambling would at least match the revenue it generates. Statistics show that there are 1.3 million Italians suffering from problem gambling but only 12,000 are being treated for it. From previous experiences where the government tends to shut regulated gambling, unregulated entities usually swoop in and they often flourish. As for the government regulated entities, they are mandated to have policies that mitigate problem gamblers but the unregulated ones will have no worry and will seek to milk all they can before the wells run dry. This being the case, it is evident that Italy will only be doing more harm than good. It would be wise for them to bring in stringent measures into the world of gambling rather than trying to push out the regulated gambling entities. 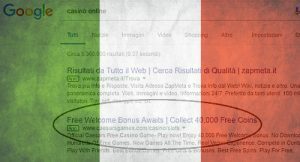 With this new law, it looks like it will make Italy’s goal to curb problem gambling counterproductive but it will only make the future of poker and gambling in Italy cloudy.